If you have used the Analytics Edge Basic Add-in or Standard Add-in, and are moving up to the paid Analytics Edge Core Add-in, you will notice that things do not work the same way. The Basic Add-in and Standard Add-ins have been updated to support a new editable Query Worksheet. This capability is coming to the Core Add-in in v5.0, but is not yet available. The rest of this article refers to the compatibility of the older versions of the Basic and Standard add-ins. First of all, any workbook you built using the Basic Add-in should work with the Core Add-in, BUT there are some cases where the compatibility may need a bit of tweaking. With the Basic Add-in, you select a cell and create a query at that cell. Behind the scenes, the add-in creates a macro that holds 2 functions: your query, and a write-to-worksheet function that writes the results of the query to that worksheet cell location. The Basic Add-in names the macro after the cell location and leaves a comment in the cell as a reminder. The Core Add-in gives you a lot more control — the macros can include a lot more functions and multiple queries. They are not associated with a single cell in a worksheet, and can have any name. Multiple macros are refreshed in sequence (alphabetically), so it is possible to build multi-step solutions where the results of one macro are used by the next macro. There are no comments in the worksheets — everything is managed from the Task Pane. You shouldn’t have to do anything to upgrade a workbook created with the Basic Add-in to work with the Core Add-in. The queries will all appear in the Task Pane as macros named after the worksheet cells they were created in. If you installed the Core Add-in on the same computer that the Basic Add-in was installed on, all of the connector accounts and configuration will work as-is. Your queries should run just like they did before. If you installed the Core Add-in on a different computer, see Sharing Workbooks. One Potential Problem: the Basic Add-in does not actually run the write-to-worksheet function that is saved as part of the macro – it forces the output into the worksheet cell that matches the name of the macro. If you moved the query or renamed the worksheet after the query was originally created, some versions of the Basic Add-in didn’t keep that ‘extra’ write-to-worksheet function in sync. 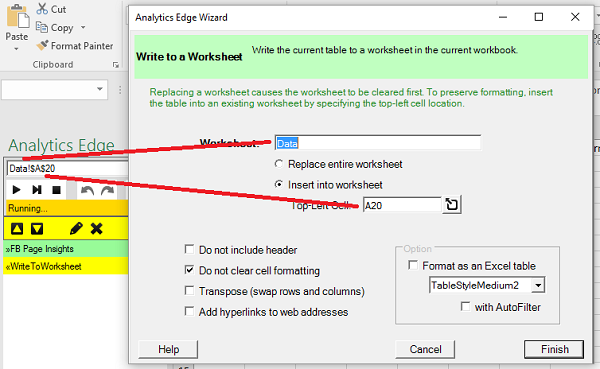 You should check to make sure that the worksheet and cell references line up with the name of the macro…and that is where you want the results to be written. This entry was posted in A. E. Core Add-in on 2016/01/03 by articles.